Please use caution. And please make char. Your degree of success will be higher if your fuel is relatively dry. It is also helpful if your fuel is segregated and burned by size. 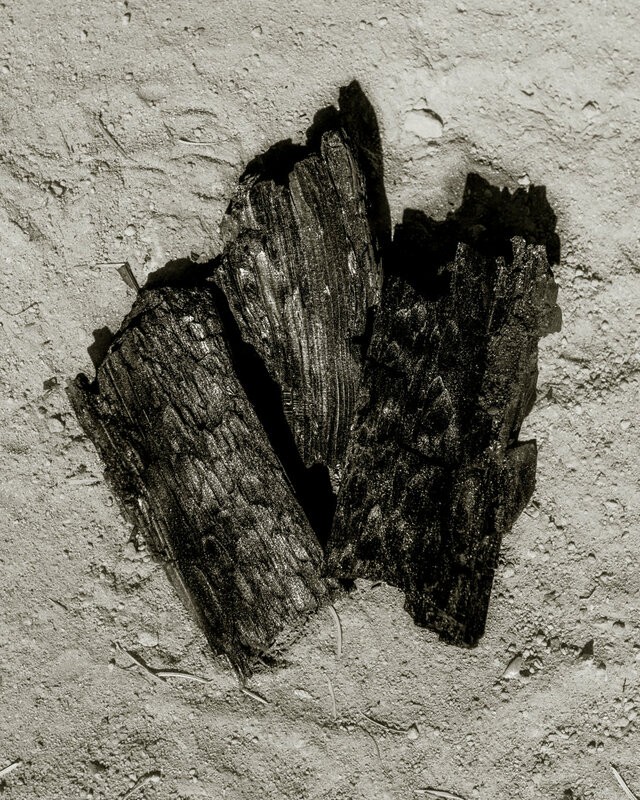 Mixing large pieces of wood with much smaller fuel will result in the large pieces not being completely charred and the small material turning to ash. Before setting up the kiln, clear the area under and around it of burnable material. A lot of heat will be generated, duff will dry quickly. Check for roots near the surface that may ignite and smolder underground. Find a metal cylinder with a proportional radius to height ratio, such as 4 foot tall by 4 foot wide. The proportions do not need to be exact, as a 55 gallon barrel will also work well. Taller heights with smaller diameter tops will result in cooler burns (below 850 degrees F) with less stable carbon fixed but a higher conversion rate of biomass to charcoal (Frederik Ronsse, GCB Bioenergy (2013) 5, 104–115). Steve explains the physics of the cylinder burn in the video below. well, seal the bottom of the kiln with dirt so that no air enters from the bottom perimeter. Add larger pieces no bigger than 12 inches in diameter, gradually filling the cylinder with burning/ burned coals. It is time to add more fuel when the previous charge is black and beginning to show grey ash. 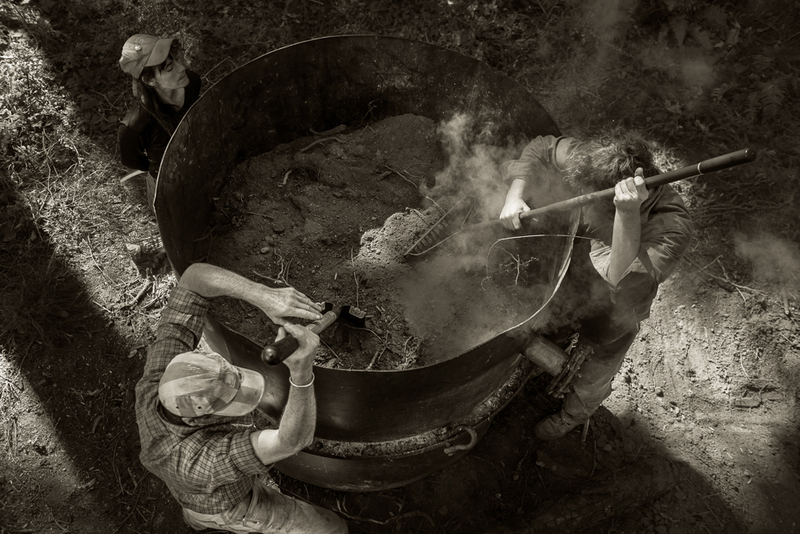 Continue adding fuel until the kiln is full of char or you run out of fuel or time. As the level of charred wood rises in the cylinder, the lower level of the outside of the cylinder should be cooler than the area of active burning, indicating that no oxygen is entering the kiln from below. The ideal temperature to burn at is between 850 to 1,050 degrees F, or 450 to 550 C. Note that the smaller the kiln and the wetter the fuel, the harder it is to maintain the higher temperatures. When the cylinder is filled with charred wood, douse coals with sufficient water to quench the flames (for a 4’ X 4’ cylinder, 5 to 10 gallons should be adequate.) Be careful not to get burned by the steam. Lid Method: Slide a fitted lid into the inside of the cylinder, so that the lid sits on top of the char, and seal the gap between the lid and the edge of the cylinder with soil. Steam leaks will indicate the need for a better seal. Once the cylinder has cooled off entirely (this takes 2 days), tip it over to retrieve the biochar. Be very careful with fresh char, as it can hold heat for a surprisingly long time. If a still live coal is exposed to air, it will burn. Make sure there is no heat in the char before transporting. Water Method: If there is plenty of water available close to the fire source, another way to put out the fire is possible, but it requires a significant amount of water (80-100 gallons and diligence). First, quench the flames with water and cool the cylinder by spraying the exterior with water. The kiln must then be tipped over, either by hand if it is a small kiln or by mechanical means (tractor or come-a-long) if larger. Spray the char with water while raking it around. Continue stirring and wetting the char while looking for hot spots. Any steam issuing from the pile indicates that the fire is not out. After an hour or two, return to the pile and spray and rake it again. It is highly recommended that the char be inspected at least once more before assuming that the fire is out and the char is safe to handle and transport. Pulverizing charcoal into small pieces and dust creates higher amounts of surface area, maximizing the charcoal’s effectiveness in the soil. In order to pulverize, make sure the charcoal is wet, as the dust can be harmful to your lungs. Place the charred coal on a tarp and crush, for example by driving a tractor or car over it. 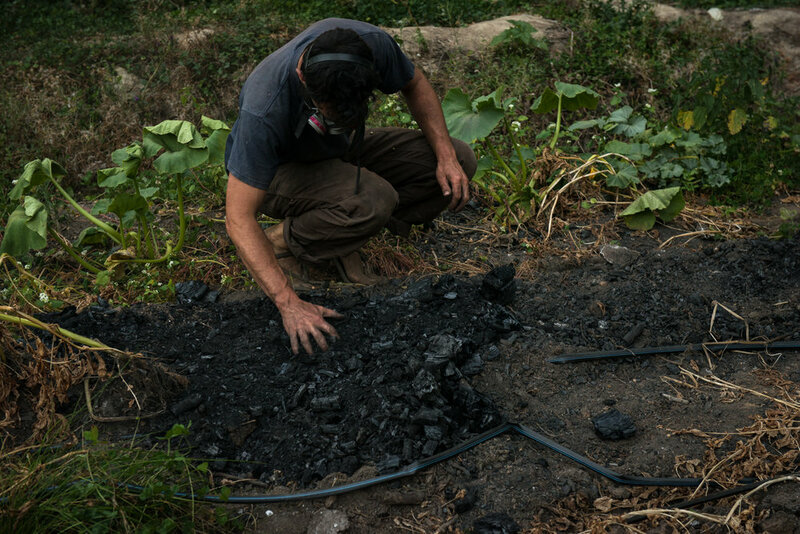 It is possible to incorporate any desired fertilizer at this point to soak into the biochar, which is also called "charging" the charcoal. These fertilizers should include nitrogen, phosphorus, and ideally active biological activity, such as found in composted manures. Dry fertilizers, such as pelleted chicken manure, can be added during her pulverizing process. You will want to wet the charcoal while charging, but do not put it in standing water, as access to oxygen is key to keeping the biological activity alive. Additional methods for charging biochar is to use it as bedding material for animals or to add it to compost piles. Raw charcoal, without adding nutrients, can absorb fertility from your soil and provide ill effects in the first year.